No - this new project will not get you free phonecalls, and it's not made by Cap'n Crunch, it's Mathieu Poignant's new mini-ITX based project. Like everybody else on these pages Mathieu (or rather his girlfriend) wants his new mini-ITX PC to look like ANYTHING but a PC. What does a man in Gay Paree use to house his gleaming new media-pc? A neat looking flightcase - and the finished product looks stupéfier. Faites-le vous-même! 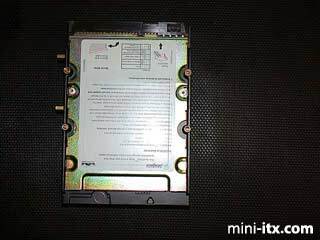 You can contact Mathieu here and us at feedback@mini-itx.com. 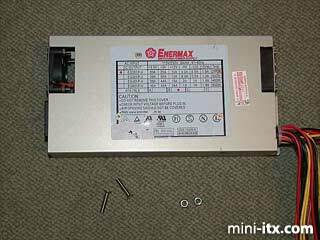 Do you have a Mini-ITX based project we should be seeing here? 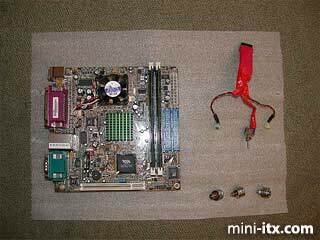 I discovered the VIA Mini-ITX boards in the beginning of July 2002. In fact, I was looking for a way to add a new hard disk, but I had no spare IDE channels. So I had two options: buy an IDE controller card, or a brand new PC. As the EPIA is cheaper than an IDE controller, the choice was quickly made. But there was no case available to put this little diamond in. As my girlfriend didn't accept the "drawer way" ("What, you want to set the flat on fire?") I had to make a case on my own - so the "BlueBox" was born. Nothing flash, just a plain working Linux file server, cool (25/30°C) and silent (no more than 20 dB). On the top right, you can see the home-made switch and LEDs. The LEDs come from a trashed Dell case (not mine ! ), and I bought the switch. The connector is an old IDE cable I've dremelized to fit with the motherboard pins. And on the bottom right, you can see the screws I used, with grooves for spacing the board from the edge of the box. 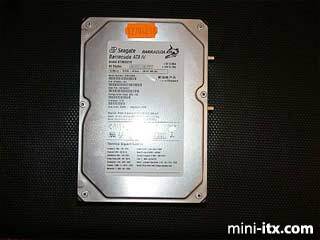 On the pictures, you can see the screws I used to space the disk from the edge of the box. These screws are generally used to fix Motherboards to standard cases. As with everything inside the BlueBox, it is fixed using screws. 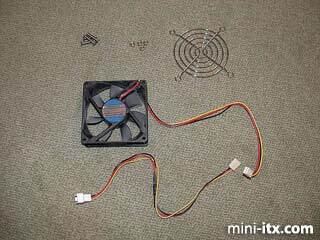 On the picture, you can see the 80mm grill, the wonderful Fan, and a 12V to 7V adapter, provided with the Fan. At 7V, the Fan produces only 11dB :-).